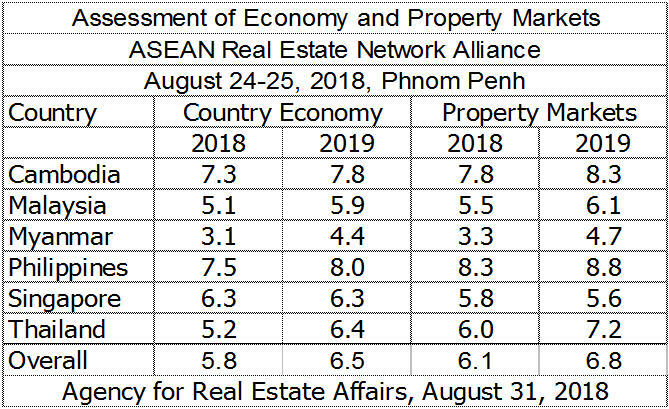 Dr.Sopon Pornchokchai, President, Agency for Real Estate Affairs and a council member of the ASEAN Real Estate Network Alliance (ARENA) who represents Thailand conducted a survey during the 2018 ARENA Convention in Phnom Penh during August 24 to 25, 2018. There were some 400 brokers and consultants from Cambodia, Indonesia, Malaysia, Myanmar, the Philippines, Singapore, Thailand and Vietnam. Some 250 questionnaires were collected and analyzed here. However, the results could be traced for only Cambodia, Malaysia, Myanmar, the Philippines, Singapore and Thailand with an ample number of participants. On the whole, it was assessed the economy and property markets are getting better over time. The most pessimistic country are now Myanmar due to the lowing down of the economy and high tax rate on real estate. However, Mr.Khin Muang Than, Chairman of the Myanmar Real Estate Services Association said some sectors of real estate such as serviced apartments are still growing. 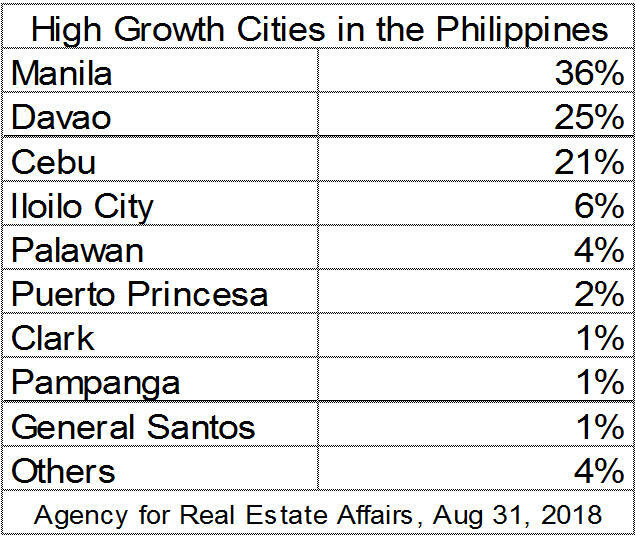 On the contrary, Cambodia and the Philippines seem to be very optimistic on their economy and property markets. It could be considered a boom time in the Philippines. Whereas, Malaysia, Singapore and Thailand are somewhat moderate. In the case of Singapore, Mr.Herman Yeo, President of the Institute of Estate Agents (IEA) said that it was most probably the recent government intervention of imposing higher buyer stamp duties. He said there were also many other factors that affects the real estate market not only in Singapore but all over the world. For instance, currently the trade wars between the big two countries, China and USA has also a part to play in the overall economy of the world, currency fluctuations, bank interest, etc., are some examples. 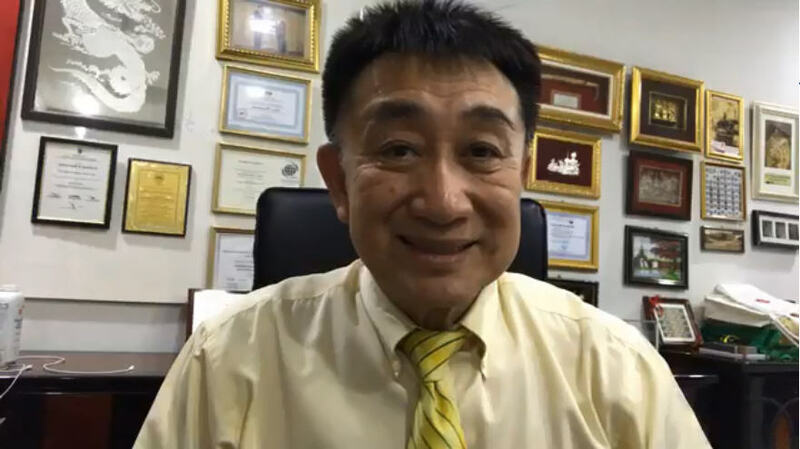 For Malaysia, Mr.Erick Kho, a former President of the Malaysian Institute of Estate Agents said that after the election, there would be a new hope and market confidences from within and aboard. 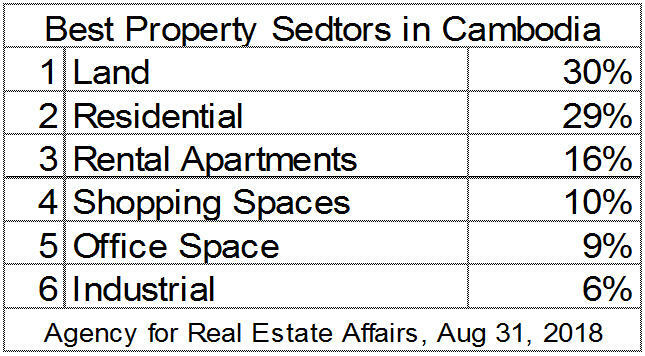 People are buying properties & spending in expanding business. In addition he sad that strong fundament economic standing of Malaysia with natural resources, plantations and hardworking business communities and investment from Belt n Road China Initiatives would help drive Malaysian economy as well. ASEAN cities with high growth should be the target for development of foreign buyers and investors. The following are some major cities voted by the experts. For Cambodia, it would be Phnom Penh, Sihanoukville, Siem Reap, Kampot Kep, Kampong Cham and others. For Malaysia, Kuala Lumpur are the most attractive, then Penang, Johor Bahru in the south and others. Very few cities in the east were mentioned. For Myanmar, Yangon was the most attractive followed by Mandalay, Taunggyi, Heho, Naypyidaw and the like. Amazingly Naypyidaw is not the very high target. For the Philippines, it was Manila followed by Davao, Cebu, Iloilo City, Palawan, Puerto Princesa, Clark, Pampanga, General Santos and the like. For Thailand, definitely, it is Bangkok followed by Pattaya, Phuket, Chaing Mai, Chonburi. Actually, Bangkok is the only primate city in Thailand. On the whole, the capital cities are more attractive followed by regional cities. Investors should also know which sectors are more promising in different countries. The following shows the overall assessment. 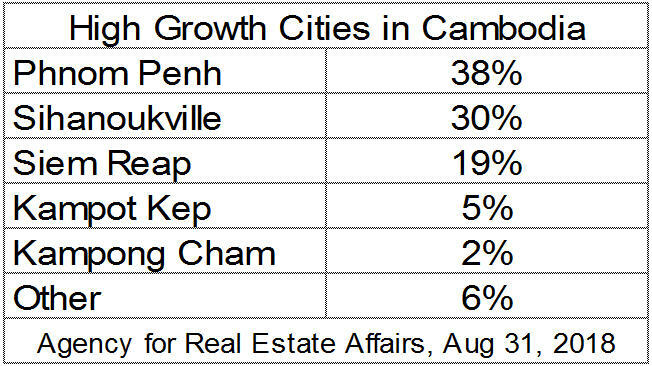 Best property sectors in Cambodia are land, residential, rental apartments, shopping spaces, office space and industrial. Best property sectors in Malaysia, residential, industrial, land, office space, shopping spaces and rental apartments. 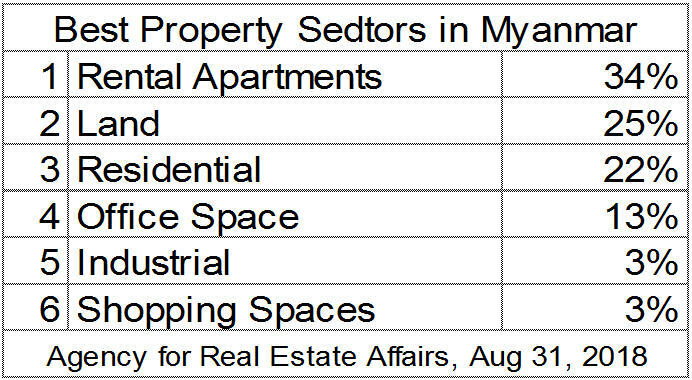 Best property sectors in Myanmar, rental apartments, land, residential, office space, industrial and shopping spaces. Best property sectors in Philippines, residential, land, office space, rental apartments, industrial and shopping spaces. 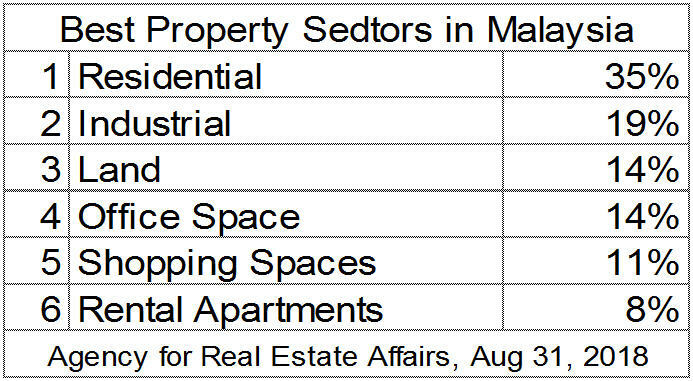 Best property sectors in Singapore, office space, shopping spaces, residential, land, rental apartments and industrial. 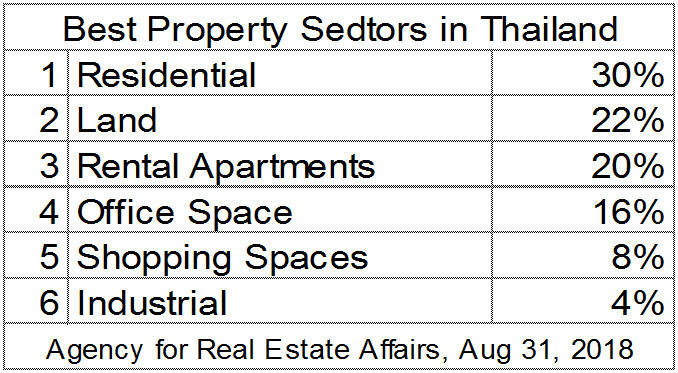 Best property sectors in Thailand, residential, land, rental apartments, office space, shopping spaces and industrial. It is also very interesting to learn that people from different countries would like to invest abroad as well. See their target cities. 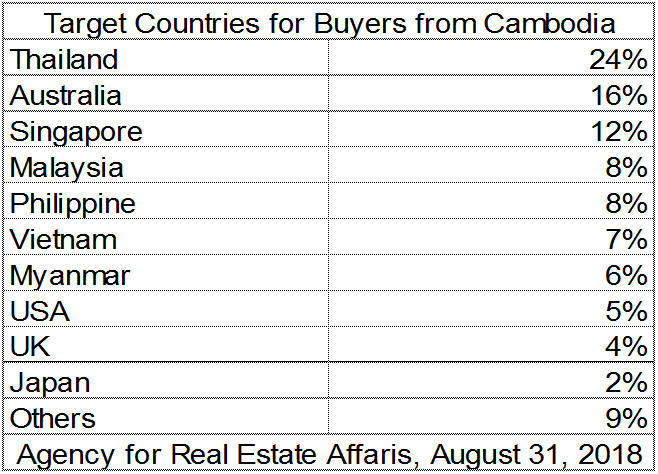 Target Countries for Buyers from Cambodia: Thailand 24%, Australia 16%, Singapore 12%, Malaysia 8%, Philippines 8% and the like. 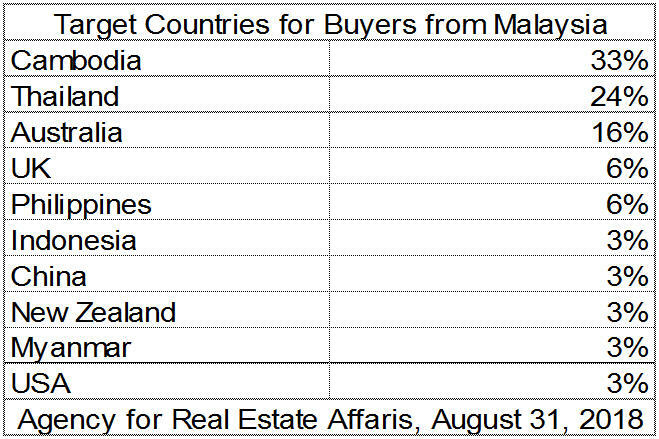 Target Countries for Buyers from Malaysia, Cambodia 33%, Thailand 24%, Australia 16%, UK 6%, Philippines 6% and the like. 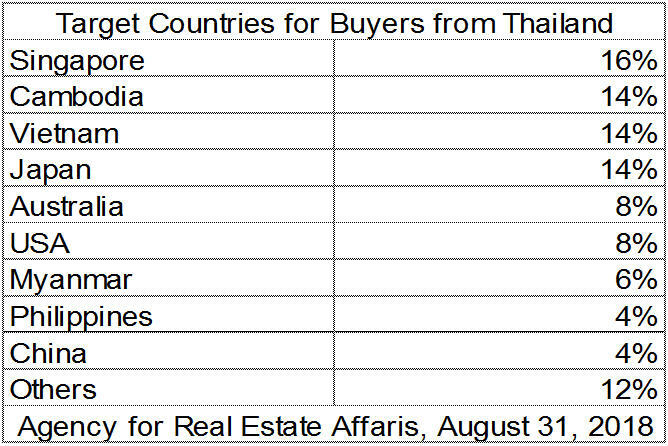 Target Countries for Buyers from Myanmar, Thailand 36%, Singapore 33%, Cambodia 24%, Canada 3% and the like. Target Countries for Buyers from the Philippines, Singapore 23%, Cambodia 20%, Thailand 13%, Malaysia 11%, USA 9% and the like. Target Countries for Buyers from Singapore, Thailand 30%, Cambodia 19%, Malaysia 14%, Australia 7%, Philippines 7%, Japan 4% and the like. Target Countries for Buyers from Thailand, Singapore 16%, Cambodia 14%, Vietnam 14%, Japan 14%, Australia 8%, USA 8% and the like. This survey results changed from the previous one (http://bit.ly/2wUsO4S). 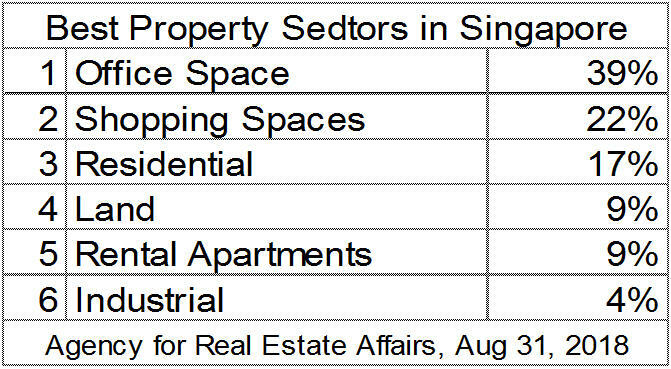 Not many investors would go to buy properties in Siingapore due to high tax rate. Mr.Harry Yeo, the IPP of the IEA elaborated further on 5th July, 2018, the Singapore Government introduced the 8th Cooling Measures to curb demand and ensure a stable & sustainable property market that an individual foreign buyers have to pay tax up to 20% of the sale price (http://bloom.bg/2u8I3Ez).